SAN FRANCISCO, August 26 – Fascists who planned a deadly provocation in this center of union power were dealt a humiliating defeat today as they were forced to call off their rally in a federal park near Golden Gate Bridge, then cancel a fall-back “press conference” and high-tail it out of town. This was a significant victory for all who are determined to take action against the fascists. The need to prevent their violent provocations was written in blood in Charlottesville, Virginia. 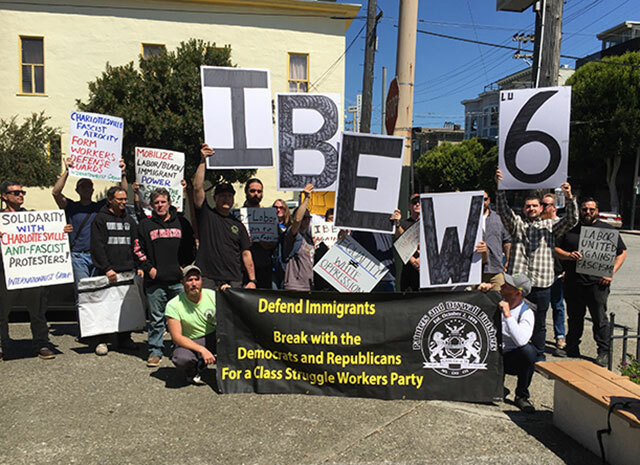 Key to running off the fascists was the move by International Longshore and Warehouse Union Local 10 to shut down the port and march to stop the fascist “Patriot Prayer” rally. 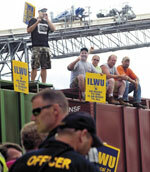 (See “ILWU Local 10 Moves to Stop the Fascists in San Francisco,” The Internationalist, 18 August.) Galvanized by this decision of the city’s most powerful and historically militant union, thousands of determined anti-fascists planned to join the dockers in driving the fascists out. Facing this prospect, “Patriot Prayer” leader Joey Gibson announced yesterday afternoon that the rally scheduled for Crissy Field was cancelled. Instead, Gibson declared, they would hold a “press conference” at Alamo Square Park, closer to the downtown area. But as anti-fascists organized to converge on that location, city authorities hastily set up heavy-duty fencing around the park to keep them out. Gibson then abruptly called off the “press conference” as well. Instead, thousands of counter-demonstrators filled the streets right in front of where he had vowed to hold it. With chants and speeches, the crowd celebrated the defeat of the fascists’ plans, then headed to the largely Latino Mission District, applauded by onlookers during the two-and-a-half mile march. Internationalist comrades raised the chant, “Joey Gibson ran away – Fascist thugs, not your day,” which was picked up by many of the marchers. This gave a glimpse of the potential power of this workforce and its union which have repeatedly shut down the ports against police terror, war and racist repression. Not only the fascists, but also the cops and their Democratic Party bosses are well aware that going up against this heavily black powerhouse of Bay Area labor is quite a different matter than attacking loosely organized protesters drawn largely from student and middle-class sectors. 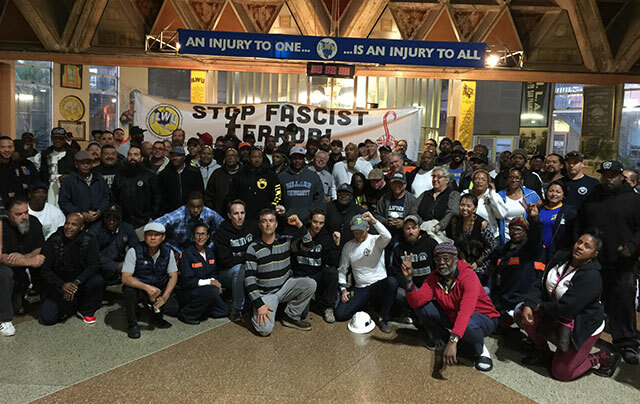 Outraged longshore workers have the power to paralyze shipping, cost the bosses millions, and crush fascist and racist terror groups in a way they would not soon forget. The need for this has been repeatedly shown on the waterfront in the recent period when racist slurs and hanging nooses – a threat of lynching – have been left at the SSA terminal in the Port of Oakland. The perspective of mobilizing working-class power in defense of all the oppressed poses the need for a class-struggle leadership of the unions and a revolutionary workers party. Far from abstract, this has been starkly shown in the recent period. Both in San Francisco and across the Bay in Berkeley, Democratic politicians and their cohorts in the union bureaucracy have sought to channel opposition and revulsion into diversionary events aimed at preventing mass struggle to stop the fascists. These events call on all and sundry to “unite against hate” far from where the fascists intend to rally. Signing on to love-ins for class-collaboration like the one called in Berkeley on August 27 are not only a long list of Democratic Party organizations but the bulk of the reformist left, from the Democratic Socialists of America, Socialist Alternative and the International Socialist Organization to smaller groupings.